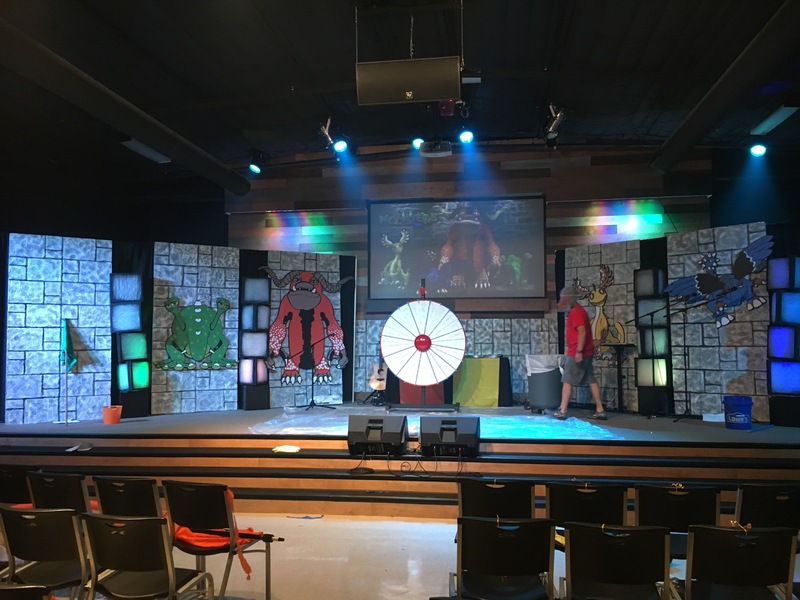 This summer I’ve had the FUN adventure of creating the stage for a camp our church does called Xtreme Adventure. Its like VBS on steroids and is for 4-6th grade children-SUPER fun & VERY high energy! This year’s theme was “Monsters” and so I teamed up with my good friend Carrie (who is SO creative!) to plan, design & create the stage. One thing we knew we wanted to make that would have high visual impact was faux stone walls! 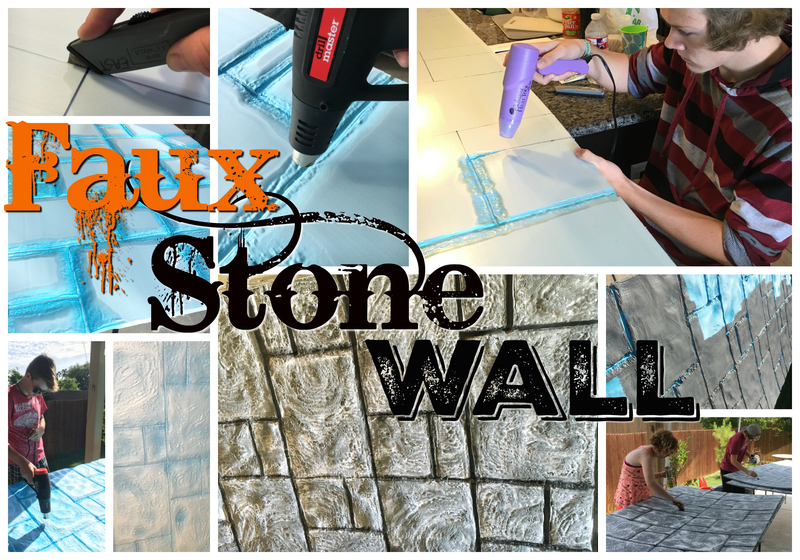 We found this idea at the Halloween Forum-these guys mad an amazing building out of the faux stone walls. You can see this on my Xtreme Adventure Stage Pinterest page. This was a crazy fun project & my teenage kids LOVED helping make this with us! 3/4″ 4’x8′ Insulation Foam Sheets (from hardware store)-make sure to get the thicker 3/4″ because its less likely to burn a hole through when applying the heat gun! 3 Values of Paint-Dark, Medium & Light (we used latex wall paint-actually found “OOPS” paint for half the cost!). Quantity depends on how many sheets you are creating. Remove the plastic coating from the sheets (this will save you much time & headache later!). ** We found that leaving the plastic coating ON made a cooler looking texture, but it was VERY difficult to remove the coating after applying the heat gun. BELIEVE ME-its worth it to take off the backing BEFORE you start the project! Draw out your grout lines with a Sharpie. You can be as precise or loose as you want the lines to be. “Score” Grout lines with an exacto or utility knife about 1/2 way through the board. Use the heat gun in varying heights from the surface to create the texture. We found that applying 1 round of texture, let cool & then briefly applying close heat in a few areas gave a nice texture. You can use a craft heat gun for softer textures (as seen by the picture with my daughter). Once all the texture is created begin by painting the darkest value of paint all over the foam-making sure to get in ALL the grooves! Paint the medium layer by LIGHTLY rolling or brushing on top. We used a small foam roller & that worked really well. The final layer of paint is the lightest (we used white). We dry brushed on “highlights”-just accenting the highest ridges on the foam. To stabilize the foam (the foam will warp with the heat), we added 1″x2″x8′ boards that we screwed into the back using 1″ screws. 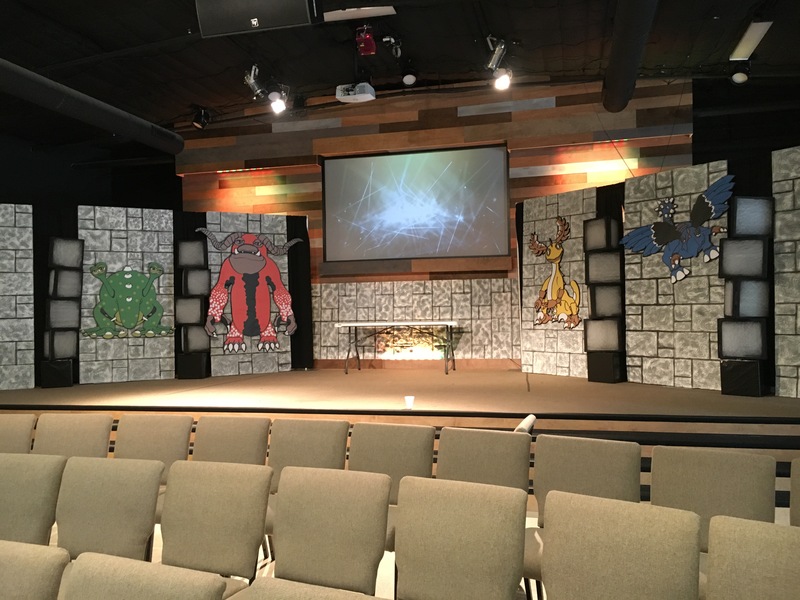 Here’s the finished stage with out the fancy lighting (the columns in between the walls light up in different colors). If you choose to use ANY of this post (written, graphic or photo), please link back to my blog Create Art with ME.